In addition, visitors to the JCB booth #K175 will be eligible to receive a voucher entitling them to a $500 rebate for any of the JCB models on display at the show. Ben Coleman, general manager of Product and Direct Sales for JCB North America, described the applicability of JCB products to the utilities sector. "JCB is a full-line construction equipment manufacturer, offering more than 300 products from skids steers to telehandlers, and backhoes to excavators," he said. "The JCB machines on display at ICUEE 2017, including the Teleskid and Hydradig, are game-changers for construction and utility contractors and will radicially improve productivity." The JCB Teleskid is a revolutionary new product that can lift 8 percent higher and reach 60 percent further forward than any other skid steer on the market and—in an industry first—it is the only skid steer in the world that can dig below grade, to a depth of three feet. Teleskid is also the only skid steer to combine vertical and radial lift capability in a single machine and features a unique system to set and maintain the bucket level throughout the boom's range of movement. Another highlight on the JCB booth will be the ICUEE debut for the JCB 110W Hydradig wheeled excavator and tool carrier. 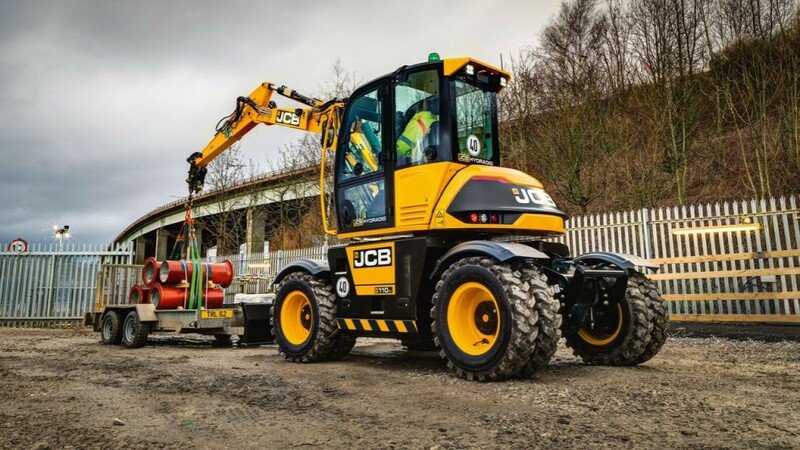 The JCB Hydradig has a sturdy, all-wheel drive, four-wheel steer chassis based on JCB's proven Loadall telescopic handler concept with three steering modes for maximum maneuverability and stability when travelling at speed. The machine is powered by the latest Tier 4 Final compliant JCB EcoMAX diesel engine, requiring no DPF and no DOC. Also expected to draw attention is the JCB 3CX Compact backhoe loader, which delivers the performance that has made JCB the world's leading backhoe manufacturer, but in a 35 percent smaller package, making it ideal for utility projects in urban locations. The 3CX Compact is compatible with skid steer loader attachments and hand-held hydraulic tools—such as a disc cutter, hammer and impact wrench—for maximum versatility. Visitors to the JCB booth will also learn about the company's latest excavator products and experience new developments in telescopic handlers, including the 509-45 Loadall with a radio remote-control work platform and a sub-compact telescopic handler that will be launched in 2018.